East side of Cornell Ave., located just west of Museum of Science & Industry. This garden has also been referred to as the Garden of the Phoenix or the Osaka Garden. This garden symbolizes the mutual respect and friendship that Japan and the United States initiated more than 120 years ago. In 1893, on Jackson Park's Wooded Island, the Japanese Government built the Ho-o-den [Phoenix Temple] as its pavilion for the World's Columbian Exposition. The Ho-o-den introduces Japan's artistic heritage to Americans and remained as a gift to Chicago after the fair ended. The original pavilion had only a small garden, however, in the 1930s the newly formed Chicago Park District restored the pavilion and added a more extensive Japanese Garden. The garden has been revitalized several times throughout the 1900s, including a 1992 project that celebrated Chicago's Sister City relationship with Osaka, Japan. One of the garden's most beautiful features is the spring time blossoming of its cherry trees. These trees have been extended beyond the garden as well and can be seen in late April to early May blooming around Jackson Park's Columbia Basin. The Japanese tradition of enjoying the beauty of flowers is known as hanami. Each spring, the blossoming trees in Jackson Park enter a peak bloom period for about 6 to 10 days. 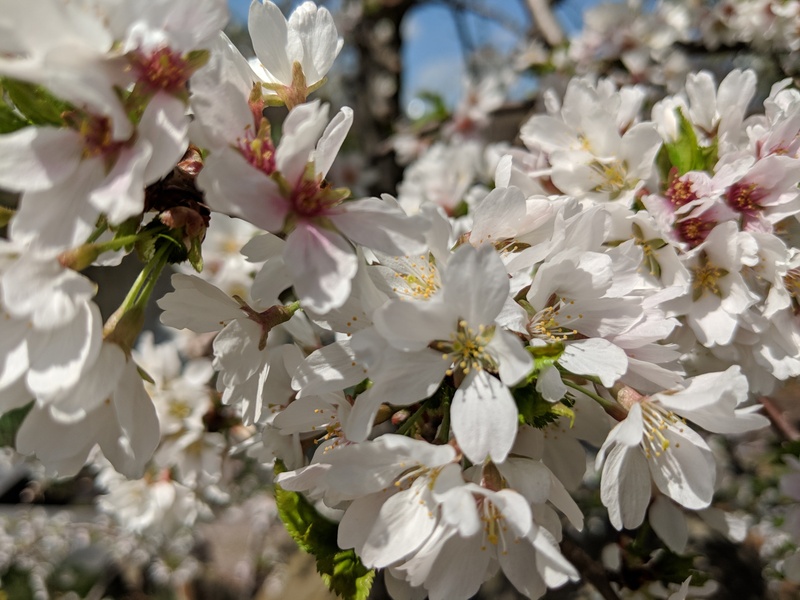 This page will be updated with a notice each year when these cherry trees enter their peak bloom; stay tuned so that you can plan your visit to Jackson Park during this time to enjoy your own hanami experience! #CHICherryBlossoms: Peak bloom is expected in the first two weeks of May this year. Continue to check back for up-to-date information on when the trees start blooming!